Develop observation skills while learning about courtship behavior. In this activity, students observe living, adult Nasonia, in an attempt to differentiate between the sexes. Students will then watch the courtship behaviors, generating a list of what they deem significant behavior. After individual observation, students will compile their lists and observe the courtship ritual again to catch any behaviors they may have missed. Finally, students will be asked to compare their observations with published findings. 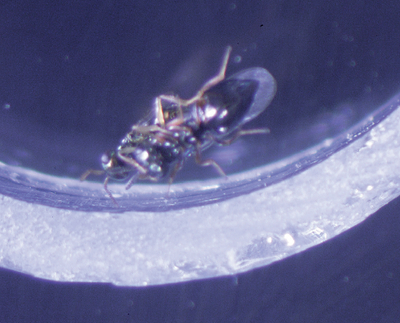 In both pre-lab and post-lab analysis, open-ended questions should lead students to consider the evolution of behaviors and the isolating mechanisms that lead to speciation. You will receive enough materials for 15 setups, a teacher’s guide, and a student copy master. Ordering information: A coupon is included for redemption of perishable materials. Redeem by mail, phone, fax, or email.